What’s the cost of environmentally friendly die board sawing machine. Laser die board cutting machine compare with environmentally friendly die board sawing machine. Our machine it's not only environmentally friendly and high quality,but also cost-saving and energy-saving. 1. It's different from laser die board cutting machine, laser die board cutting machine needs complicated configuration and costs a lot for maintenance. For Environmentally friendly die board sawing machine, the saw blade is the only consumption. 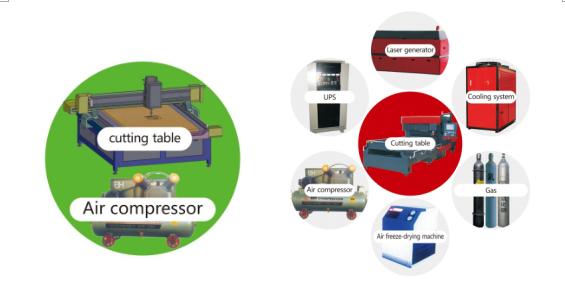 2. laser die board cutting machine needs: CNC machine, laser generator, special power supply system, laser control system, gas supply system, cooling system and air compressor. Yisong environmentally friendly die board sawing machine is very simple, only consist of cutting table and air compressor. 3. Then you need to think about the plant ventilation, because laser die board cutting machine is using high- pressure gas which will caused the open fires. And during the working processing, burning smell generated by laser cutting machine may impact on surrounding community. It's more important that you living in a country that strictly pay attention to environmental protection. 4. Laser die board cutting machine consists of complex parts, that the installation is huge project & long period. Also different system needs to be installed separately. Yisong environmentally friendly die board sawing machine is using saw blade to cut the board automatically, which without using laser, during the working processing, no smoke and toxic gas. That means you do not have to worry about environmentally friendly pollution complains and you don't need to install smoke filtering and purifier device. As well as, our machine is very simple. Also, small space needed for machine layout, it will cost much lower rent. < why environmentally friendly die board sawing machine can replace laser die board cutting machine?